Is it safe to go ahead and call this season, the season of the tassel? From earrings to bathing suites to pillows to sandals… they’re everywhere! And if you’re anything like me, you have been eating. it. up. But as stand-out as they are, maybe you’re left wondering how on earth to create a look around tasseled accessories… one that manages to be fun and age appropriate at the same time? I’ve got ya, sister. Let’s unpack it! While there’s no hard-and-fast rule on tassel do’s and don’ts, there are a couple guidelines I stick to in centering looks around these fun accessories. 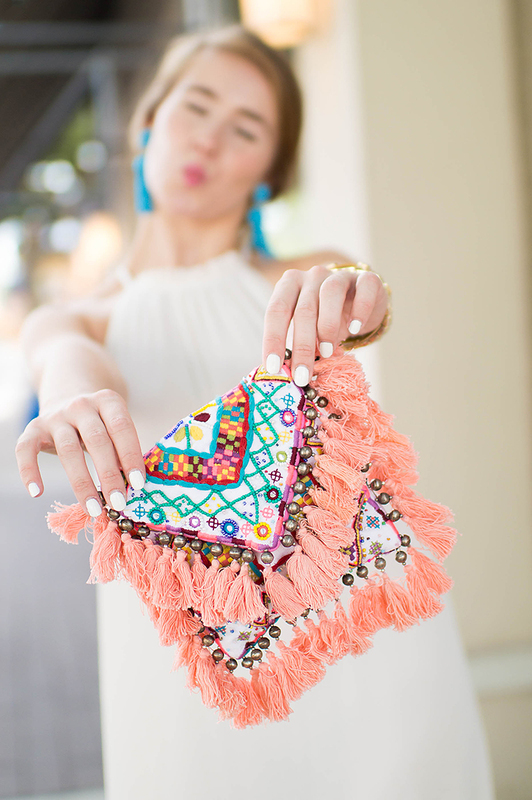 Y’all know I am all in favor of bright colors and bold patterns, but when it comes to tassel accessories, there’s a very thin line between a look that’s cute and one that’s WAY overboard. Stay soundly in the ship by minimizing the “noise” going on in the rest of your outfit and choosing solids over busy prints. The $49 cream maxi dress I’m wearing in today’s post does a great job of letting the tassels do the talking, while still holding it’s own. I adore the ruffled neckline and billowy cut, and already know I’ll be packing it up for my family’s beach trip at the end of the summer! Wearing tassels constitutes as a statement in and of itself, so while eye-catching statement colors are fun, I usually opt for shades I already wear on the reg. In fact, if you purchase tasseled items in colors you feel comfortable with and already wear often, you’ll find it much easier to style them, and you’ll definitely get more wear out of them! Turquoise is my favorite accent color, so I knew a pair of statement turquoise tassel earrings would fit well into my already-formed wardrobe. (Conversely, I also have a pair of orange tassel earrings that I hardly ever wear…) Likewise, I’m always adding pops of pink into my outfits, so a pink tasseled purse didn’t seem like a stretch to me. Imagine how much harder it would have been to style purple earrings and a yellow tasseled purse… fun, perhaps, but not nearly as repeatable. It’s definitely possible to wear a few tasseled items together at once, but make sure they compliment one another in terms of color. If you find your accessories are clashing, pick one winner and save the rest for another time. At the end of the day, there is absolutely no right or wrong way to wear tasseled accessories… hear me say that! I hope you’re wearing whatever it is that makes you feel confident, and puts some pep in your step. These are just a few tips I stick to. :) Keep on tasslin’ y’all! Love this post!! My motto lately has been “you’re never fully dressed without a tassel”! Great outfit!! I have been loving tassels lately! I absolutely love your maxi dress, and the whole outfit is just so fun for summer. I love it! Love love love this look! 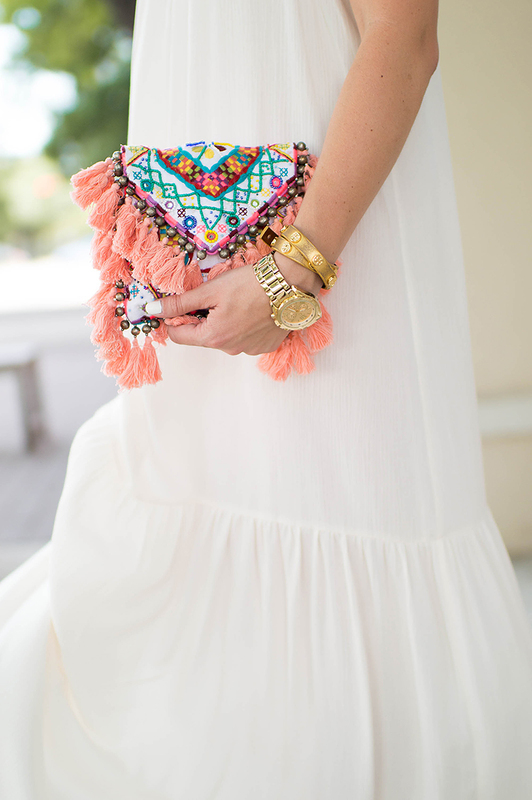 That maxi is gorgeous and I have those earrings and wear them all the time! Love it! Perfect outfit! I see that the maxi comes in a blue shade also. Love your summer white choice, but how sheer is it in real life? 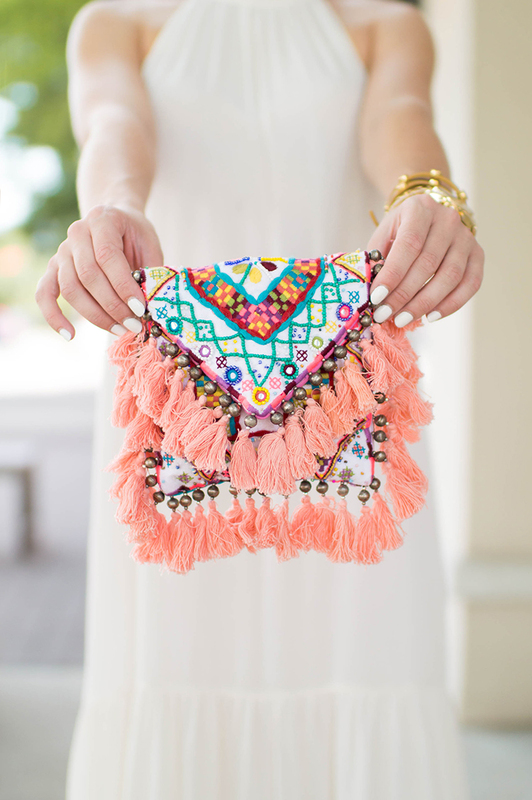 Love tassels and love these tips on tassels! So cute! LOVE this outfit, so simple and beautiful! Also love the tips on how to wear tassels, so helpful! So beautifully put together! I can’t get to the link of the clutch it keeps taking me to the earrings! please share where the clutch is from, thanks!